Opening day of the DII women’s soccer season is finally here. Last season was a season of firsts. 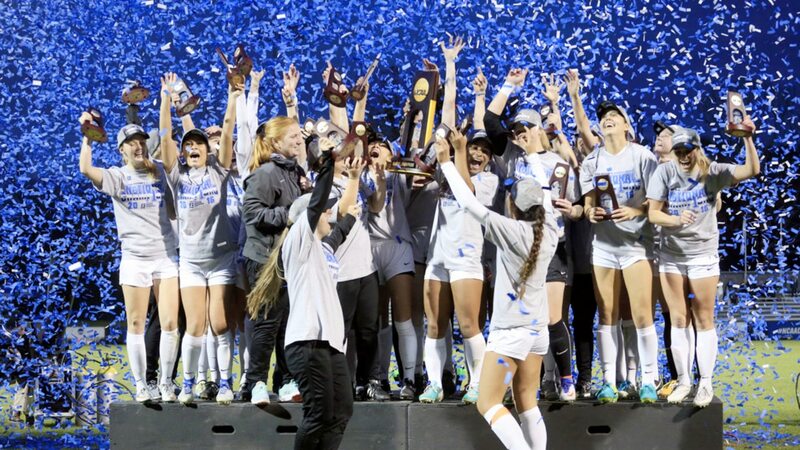 Central Missouri hoisted its first DII women’s soccer national championship trophy, while Mercy and UC Colorado Springs made the first national semifinals appearances in program history. What does 2018 have in store for an encore? Let’s take a look around the top 25 to see if we can find out. What’s next for Central Missouri? Ana Dilkes is graduated. The all-world goalkeeper had a record-setting career end by hoisting the DII women’s soccer championship trophy. In four years in net for the Jennies, Dilkes allowed 36 goals and posted a record 64 shutouts, a DII record and second-most across all three divisions. To put it in perspective, Dilkes allowed 16 of those 36 goals during her freshman season. Over the last three years in which Dilkes allowed an average of 6.67 goals per season, the Jennies were 68-4-1 with two quarterfinal appearances and the 2017 title. The Jennies return 2017 leading scorer Jada Scott as well as Makayla Toth who scored an impressive 11 goals as a freshman last season. Those two should help the offense stay strong, despite losing Abby Rhodes and Baylie Edwards to graduation. The big question mark is what happens in net? We’ll find out very quickly. The Jennies open against preseason No. 17 Southwest Oklahoma State, who return two of DII’s most prolific goal scorers in juniors Alimata Robo (28 goals) and Sandra Nabweteme (13), before facing an Augustana (SD) team that received votes in the preseason poll as well as No. 20 Minnesota State. All that before Mid-America Intercollegiate Athletics Association play begins and the Jennies begin their quest for their ninth-straight regular season conference championship. Central Missouri isn’t the only team replacing some of its program’s legends. Western Washington has been on a run for the ages the past two seasons. The Vikings have won 42 of their last 44 games, including a 23-0-1 run to the 2016 national championship. Though they return nine starters, Sierra Shugarts is not one of them. What didn’t Shugarts accomplish in her time at Bellingham, Washington? The star defender was a national champion, an All-American, the 2016 DII national player of the year (only the second defender ever to do so, incidentally), and claimed multiple All-West Region honors. Her defensive prowess helped the Vikings to a 79-5-6 record and a 39-game winning streak. Though the Vikings have plenty of key pieces back, primarily the dangerous Gabriela Pelogi at forward and reigning Great Northwest Athletic Conference newcomer of the year Karli White, it will be interesting to see how the defense keeps up without Shugarts. They will be put to the test early, playing No. 5 UC San Diego on the road in their second game of the season, the very same Tritons team that ended the Vikings season in the third round of the tournament in 2017. And what about Grand Valley State? The Lakers, who appeared in four of the last five national championship games, winning three of them, are no stranger to success. Heading into 2017, the Lakers lost Marti Corby to graduation, but continued to produce one of the most exciting offenses in DII thanks to Gabriella Mencotti. With Mencotti lost to graduation, who is the next Lakers star in the making? Mencotti led DII in goals last season, scoring 30. That’s one better than the 29 she scored in 2016 to lead the division. That’s a lot of goals to replace, but there are a couple of players to keep eyes on that could help. The Great Lakes Intercollegiate Athletic Conference freshman of the year Ava Cook is coming off a 13-goal debut. She was also unselfish, assisting on 11 others. Senior midfielder Tara Lierman also scored 13 goals but may be asked to take on a more prominent defensive role in 2018. One thing we know; one way or the other the Lakers are going to score goals, the only question is who will be scoring them. Can Mercy and UC Colorado Springs match those record-setting 2017 seasons? Both Mercy and UC Colorado Springs lived dream seasons that led them to their respective program’s debut in the national semifinals. Can they find that magic and make another deep run in 2018? There’s no reason to think the Mountain Lions can’t get back to the NCAA postseason. They return four of their top five scorers from last season and now have that tournament experience. That doesn’t even include the Rocky Mountain Athletic Conference preseason defender of the year, Savannah Boarman. Tarah Patterson, who took home RMAC freshman of the year honors in 2017, led the team in both goals and assists and will look to once again lead a young and exciting offense while Boarman brings balance to the defense. Mercy enters the season ranked No. 4 in a very different position than UCCS. Heidi Serna, the all-time leading goal scorer at Mercy, is gone. As is All-American Ally Boots who led the Mavericks in scoring a year ago. Also gone is head coach Jonathan Feinstein, who not only led the Mavericks to their best single-season record of 18-4-1 last year but leaves as the winningest coach in program history. Jim O’Brien enters and has some very nice pieces returning. Rebecca Conway was tabbed the East Coast Conference preseason defensive player of the year, while Haley Noble led all returners in scoring last season. This is a new-look Mavericks team with nine newcomers looking for a chance to contribute. With an opening day bout against No. 24 Southern New Hampshire, the young Mavericks will be tested on Day 1.
Who can be the next big thing? It seems like there are a lot of newcomers to the national semifinals of late. Kutztown made an impressive run to its first semifinals in 2016 and UCCS and Mercy followed that in 2017. Can anyone breakthrough and be the 2018 semifinals rookies? Concordia (Oregon) is entering its fourth season as a DII program. The 2013 NAIA national champions have had an impressive first three years and seem poised to make a deep run in the NCAA postseason. The Cavaliers compiled their best record as a DII program last year at 16-4-3, handing Western Washington its lone GNAC loss to claim their first-ever GNAC regular-season title. The good times kept rolling when Concordia defeated Chico State in the first round to record the program’s first tournament win in shutout fashion. The Cavaliers test themselves early, with an out-of-conference bout against No. 25 Sonoma State before opening GNAC play against new rival No. 7 Western Washington. With eight starters returning, including the 2017 GNAC player of the year Gabrielle Ewing, there is plenty of reason to think the Cavaliers are ready for the next step. How about those SWOSU Bulldogs? The program has just a 131-209-33 record with just two NCAA tournament appearances to their name. But they seem to have found some winning ways, now 38-14-9 over the past three seasons, going the furthest they ever have in last year’s NCAA postseason. Rabo, entering her third season with the Bulldogs, is a DII star with 40 goals scored over the past two seasons. Her wingman Nabweteme has put 35 goals in net over the same span. In just two years, the duo finds themselves No. 1 and 2 in several categories in the SWOSU record book and could find themselves in the same spot for assists after this season. This team has 15 upperclassmen and five returning starters, so there is both experience and urgency for the Bulldogs.